Nightlife is an important part of Shanghai culture. As China's business center, with the most expatriates and foreigners, Shanghai's bar scene is quite different from Beijing's bar-star vibe. The nightlife is more sophisticated and multi-cultural. 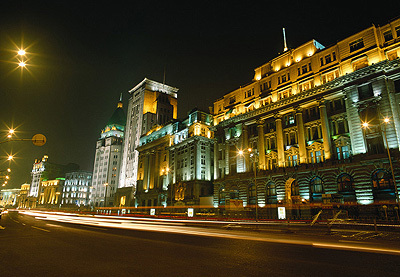 The beautiful Bund, dazzling department stores on Nanjinglu, Huaihailu and Xujiahui streets and intimate bars along old and new bar strips make for a unique night out. Here are Shanghai's top 10 hot nightspots for shopping, dining and partying. After a long day in front of their computers, many young professionals go to rest their eyes on the Bund's beautiful scenery. The 1,500 m Bund runs from Waibaidu Bridge in the north at the mouth of Suzhou River south to Jingling Road formerly known as the Far East Wall Street. When the sun sets, colorful lamps contrast with the glitzy Oriental Pearl Tower and Jinmao Tower on the opposite bank of the Pujing River. Although the Bund's buildings were designed by different architects over different periods, they go together well. Some of the most well known spots are the British-style Dongfeng Restaurant, in the old Shanghai Club building; the Greek style No.12 Bund Igloo in a former HSBC building, and the Customs Building, a sister building to the old HSBC bank.